Automated: 1978. Located on the eastern end of Maury Island, the light marks a key safe channel in the Puget Sound waters between Seattle and Tacoma,Washington. The Point Robinson Station started in 1885 as a fog signal station to warn vessels away from a dangerous spit of sand that extended several hundred yards into the sound. By 1887 the Bureau of Lighthouses Board concluded that the fog signal was inadequate, so a modest lantern and lens were added to the station. 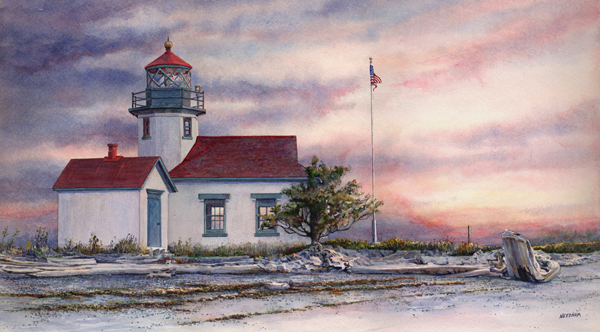 As shipping increased in the lower Puget Sound the station grew in importance which lead the Bureau of Lighthouses to construct a full-fledged Lighthouse in 1915. This new station with it’s thirty-eight foot octagonal masonry tower and lantern room sits approximately 150 yards out on the spit. The light station was automated in 1978, but it still retains it’s original fifth-order Fresnel lens with a range of 13 miles.